I love getting new cake commissions because it almost always means I get to try out something new. 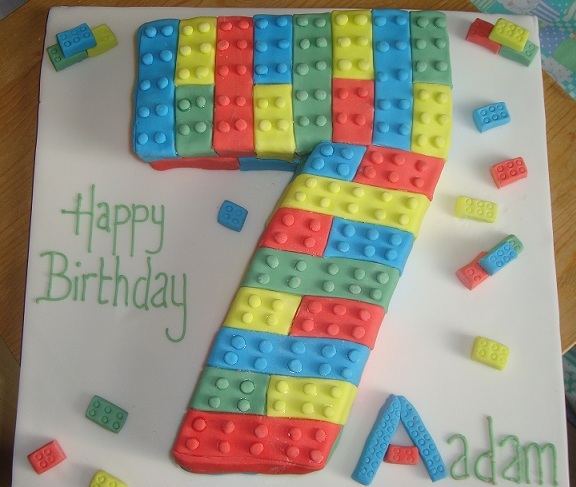 I was very excited when a friend asked me to create a Lego themed cake for her son’s 7th birthday last weekend. She came up with the fantastic idea of making it into a number 7 and I struggled to work out how I would make the bricks look like they were facing the right way! I quickly dismissed Dale‘s helpful comment that I should make each brick individually out of cake and stack them up, and decided just to cover the cake in different coloured sugar paste to make it look like it was Lego bricks. It all came together ok in the end and wasn’t too tricky to make. I used a ribbon cutter to make sure the bricks were all the same depth and rolled endless tiny balls to make the blobs on the top! All in all, a very fun cake to make and apparently it went down very well at the party. That is a fabulous cake. I struggle with boys sometimes, coming up with new ideas. 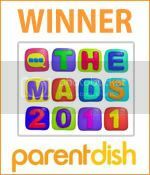 Totally love this, can see it being a huge hit – bet the child loved it. I agree, boys cakes can be more tricky but I think any little boy would be pleased with a lego cake. Glad to have provided inspiration. It’s quite an easy one to make. Wowzers! Always in awe of a cake baker that can pull off magic like this. It is a great cake…my 8 yr old loves Lego…was thinking of Star Wars cake for him, but now thinking Lego Star Wars!!! That sounds ace, I’m sure he’ll love it!